← Leaving Your Child Home Alone… Aaaaggghhhhh! I don’t know what the morning is like around your house, but if it’s anything like mine, with three children under the roof, you are running around getting everyone, including yourself, ready to head out for the day. “Ok everyone; you have exactly 10 minutes before you have to leave for school! What are you doing in your pyjamas still! Move it!” Sound familiar? What saves time for me in the morning, is having the children walk to school. While other parents drive their children to school, I opt to wave good-bye in the driveway and head to work instead. We are a blended family with children heading to two different schools in the area. 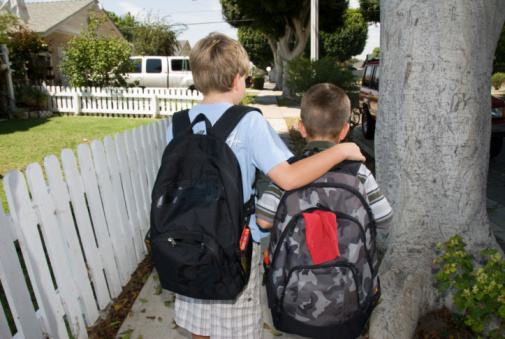 The two boys walk together to and from school (they are 12 and 9 years old) and have been walking together for the last two years. They watch out for each other, and this stops us from worrying about their safety. My daughter on the other hand, is alone and thus has a walking buddy. He is a Grade 7 student we hired to walk her to school. This arrangement has been so successful that I’ve been able to convince another parent to do the same and now he walks two children to school. What a win-win-win scenario! The children love the independence of walking, the Grade 7 student makes a few dollars and I have the piece of mind knowing she arrives to school safely. In addition, they all benefit from the fresh air, socialization and physical activity. I got the idea of a walking buddy from the Active and Safe Routes to School Program. My daughter loves to walk to school. She is already asking to walk on her own. I’ll give her another year of mentoring from the Grade 7 student, so she can develop skills related to street safety, problem solving, and decision-making. In the meantime, it’s a quick kiss on the cheek, a wave of the hand and I am off with enough time to drive to my favourite coffee shop to grab a latte on the way to work! Win-win-win! Well, fast forward two years and things have changed! My stepsons, now in high school and grade 6, each walk on their own to school and my daughter Caitlin, 11 years old, has graduated to become a walking buddy to two younger girls in grades two and four. Caitlin loves her first job, the freedom of making her own money, and the responsibility of looking after the girls. I am thrilled, she is thrilled, the other parents are thrilled and the girls love hanging out with a grade ‘sixer’. This venture has also spun into babysitting opportunities for Caitlin – another chance for her to be responsible and make money. Of course, when it is -30, with the wind chill, they are driven in the mornings, but, she bundles up for the walk home and when she gets in, makes herself a nice hot chocolate to warm up. I am so proud of her, but most of all, I enjoy watching how seriously she takes this walking buddy business. Her step brother, who is the same age, declared his envy of her money-making venture and decided to get a paper route. Yes, the kids are growing-up. They make their own cash, can purchase their own items and now I have some extra dollars in my wallet. Time to book a pedicure! Jennifer Jenkins-Scott has been a health professional for 28 years. She lives in Dundas, Ontario with her three children, husband and the family dog. When she is not at work she can be found chauffeuring the kids around to various activities, or if she is lucky, on the bike trails, in the gym, skiing, crafting, entertaining or at home with a good book or movie. This entry was posted in Children & Tweens, Emotional Well-Being & Mental Health for Your Child/Tween, Keeping Your Child/Tween Safe, Parenting Your Child/Tween and tagged active, child, children, Physical Health, safe, school, school health, walk, walk to school. Bookmark the permalink. 5 Responses to I let my kids walk to school!